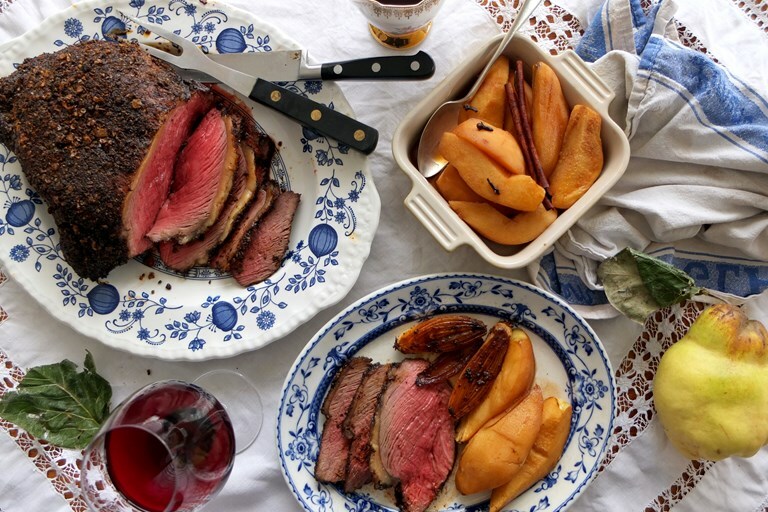 Helen Graves served up a stunning roast picanha recipe with some subtly spiced quince for a brilliant autumnal roast dinner. Picanha, also known as rump cap, makes a fantastic roasting cut, as the meat can be cooked to perfection in under an hour. Make sure you rest the beef before serving for optimum tenderness. Picanha, or rump cap, is an underused cut of beef in the UK, despite the fact that it has loads of flavour. In Brazil, it is the most prized cut, and the one you will often see skewered and sizzling over a hot grill. It’s also great as a super quick roast, however, with a 1.5kg piece of meat cooking to medium rare in just under an hour. I’ve steered towards North Africa with the flavours here, using lots of bold spice and serving it with roasted quince, a particularly fragrant fruit that makes a lovely sweet and sour accompaniment to the meat. The picanha is rubbed with a mixture of white and black peppercorns, bay leaves, and a combination of hot and smoky chillies including guiajillo and pasilla. The result is a spicy, highly seasoned crust, which would also work well on the barbecue. The quince are simmered in a sugar syrup along with cinnamon, cloves and a hefty slosh of Marsala, before being baked in the oven. Together with the beef this is an unusual and impressive combination that makes a nice change from the usual roast dinner. Don’t forget to save the shallots that cook underneath the beef, as they soak up the sticky beef fat and spices and are excellent as a side dish. In keeping with the North African/Latin American vibes it would be lovely to serve this with a pilaf, although it’s great as it is. A Californian, South African or Australian Pinot Noir alongside wouldn’t hurt one bit.